Nobody likes to read a wall of text, even when it’s just plain text. When it comes to reading code, the problem is even bigger. Code can have different formatting styles, which could make a job either easier or more difficult. It can make code difficult to decipher and understand. A clean and neat SQL is read faster than an inconsistently written SQL; SQL reviewing and troubleshooting is more efficient; joint development efforts are more effective; handing off projects from one team to another is smoother. How to make SQL code readable, so that it is enough just to skim through the code and get the general idea. It’s the SQL formatting that makes the difference. Once the rules are set, find an easy way to enforce them. Manually applying all the rules is a time-consuming process where mistakes are very likely to happen. Use our SQL code formatter as a solution here. 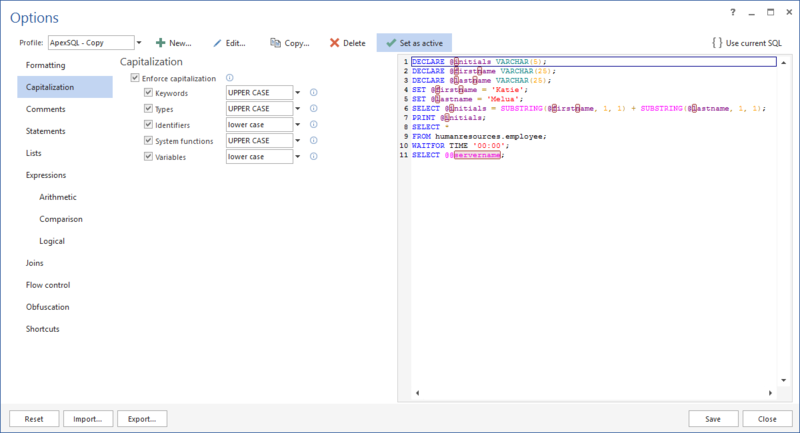 ApexSQL Refactor is a SQL Server Management Studio and Visual Studio add-in which formats and refactors SQL utilizing over 200 formatting options. It can be used to distribute and enforce SQL formatting rules among team members. Indenting makes SQL easier to follow, as it makes it visually structured. It’s recommended not to indent the first line in a multiple line statement, so it would be clear where the statement starts. Make sure that the SQL left margin is indented per the section nesting. Be consistent with indenting – set up several spaces to use for a tab, or always use the same number of spaces. Using tabs instead of spaces is easier, as it requires less clicks, but when cutting and pasting of SQL code is started, spaces are easier to handle. Parentheses can be used in different contexts – in SELECT statements, function parameters, DDL statements, mathematical expressions, etc. Now all colleagues will have the same formatting.